–Jordan C. Paul, CEO Aquila Property Company, Inc.
“This is an outstanding guide for those who are interested in investing in apartment buildings. 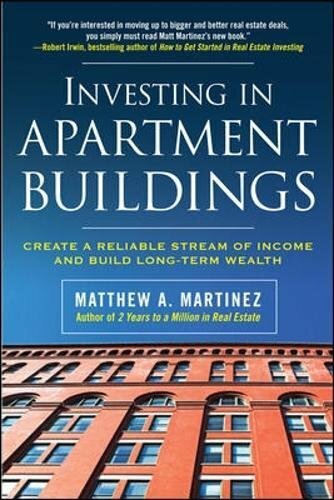 Matt Martinez has created a well-thought-out and informative book for the novice, intermediate and experienced multi-unit apartment investor. He discuses in great detail farm areas, sourcing properties, value-add deals, property management, value determinations, financial analysis and underwriting guidelines, negotiating strategies and how to succeed in this challenging but rewarding business. He also uses real-life examples to help the reader better understand the principles he teaches. This is an outstanding book that anyone who is seriously interested in apartment buildings must read! “When I started in real estate investing, Matt Martinez sat down with me and explained how to do things properly. His guidance gave me both the analytical framework and courage to succeed. In fact, I just bought my third apartment building. This book encapsulates much of his wisdom and is definitely a must read for anyone serious about real estate investing. 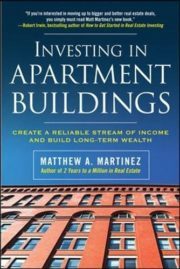 “Investing in Apartment Buildings is not only another story of success, but one that lets you profit from Matthew Martinez’s experience. The writing style makes you feel like you’re talking with a friend. This book provides a great description of the current industry’s situation, ideas to capture opportunities and tools to assess each investment. It represents a very compelling guide to help you ask the right questions and understand the answers when considering real estate deals.